The San Jose Blog: Hack Your Ride on June 6th! Hack Your Ride on June 6th! VTA is hosting a great event for technical minds next Saturday called "Hack My Ride." This is actually part of a Knight Foundation grant to make Downtown San Jose even more exciting and innovative. The challenge is transforming how people get around Silicon Valley using a variety of apps and tools. Goals include making it easier to plan trips, wayfinding, connecting with surroundings, and generally make transportation a better experience. Along with the Hackathon, Microsoft Silicon Valley is sponsoring a free lunch via two food trucks: Oh Miso Hungry and The Kabab Job. You can also be the first to learn about Downtown San Jose's new Bluetooth beacons and compete for $30,000 worth of prizes across 8 different categories. If you're a techie--and I know many of us are--this is a great way to put your skills to use in a way that will benefit the whole community! You can either scroll down for more info or head over to the VTA event page over here. Hack My Ride 2.0 challenges you to transform how we get around in Silicon Valley. Build working apps and tools that will make it easier for people to plan trips, connect with their surroundings, and enrich their transportation experience. Food trucks! Oh Miso Hungry and The Kabob Job will provide free lunch thanks to Microsoft Silicon Valley, to fuel your creativity and get you outside for a break from coding. Beacons! Hack My Ride 2.0 hackathon participants will be the first to learn about the Bluetooth beacons we’ll be testing in our system, including how to use them in your projects. Lightning talks! The hackathon will start with brief talks from VTA, Prospect Silicon Valley and others about transportation innovation in Silicon Valley, VTA open data, beacons, the Internet of Things, and today’s mobility challenges and opportunities. $30,000 in prizes! If you’re looking to raise the funds to launch a business building out your app idea, the Hack My Ride app challenge is a great way to gain visibility and resources. 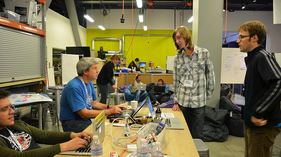 This is a three-month online app challenge kicked off with a hackathon at The Tech Museum of Innovation on June 6, 2015. RSVP to the hackathon learn about the data available (including being the first to access the beacons we’re testing), form a team, and start developing your submission. Learn more about the three-month challenge, including rules, prizes and the submission process, at hackmyride2.challengepost.com. Share the link on Meetup, Twitter, Reddit or wherever you connect with your fellow transportation hackers! To get your creative juices flowing, Microsoft Silicon Valley and Knight Foundation are generously offering $30,000 in prizes in eight app challenge prize categories, so there are plenty of opportunities for your app to win. Or submit several times, if you have a bunch of great ideas and can’t pick just one! Read more on Headways, VTA's blog. Follow @VTA on Twitter, like our Facebook page, or click here to subscribe to updates from Headways, VTA’s official blog.